A plant-based diet is a diet consisting mostly or entirely of foods derived from plants, including vegetables, grains, nuts, seeds, legumes and fruits, and with few or no animal products. Historically, it was explained that "[a] plant-based diet is not necessarily a vegetarian diet", as "[m]any people on plant-based diets continue to use meat products and/or fish but in smaller quantities". The use of the phrase plant-based has changed over time, and examples can be found of the phrase "plant-based diet" being used to refer to vegan diets, which contain no food from animal sources, to vegetarian diets which include eggs and dairy but no meat, and to diets with varying amounts of animal-based foods, such as semi-vegetarian diets which contain small amounts of meat. The Academy of Nutrition and Dietetics issued a position statement proposing that well-planned plant diets support health and are appropriate throughout life, including pregnancy, lactation, childhood, adulthood, and for athletes. A 2017 review of clinical research on the dietary patterns of people with type 2 diabetes stated that the kinds of carbohydrates (unrefined versus refined), fats (monounsaturated and polyunsaturated versus saturated and trans), and protein (plant versus animal) in a plant-based diet have significant roles in lowering the risk and managing diabetes and other diseases, such as cardiovascular disorders, obesity, and cancer. As of the early 2000s, it was estimated that four billion people live primarily on a plant-based diet, some because of limits caused by shortages of cropland, freshwater, and energy resources. A plant-based diet has been accepted by the American Dietetics Association, as being nutritionally adequate at all stages of life, including during pregnancy, infancy, as well as for athletes. I taught cooking classes for the national non-profit, Physicians Committee for Responsible Medicine, and during that time, the phrase "plant-based diet" came to be used as a euphemism for vegan eating, or "the 'v' word." It was developed to take the emphasis off the word vegan, because some associated it with being too extreme a position, sometimes based exclusively in animal rights versus a health rationale. 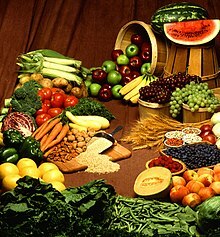 Several authoritative resources use the phrase plant-based diet to refer to diets including varying degrees of animal products, defining "plant-based diets" as, for example "diets that include generous amounts of plant foods and limited amounts of animal foods", and as diets "rich in a variety of vegetables and fruits, legumes, and minimally processed starchy staple foods and limiting red meat consumption, if red meat is eaten at all". Others draw a distinction between "plant-based" and "plant-only". Veganism: diet of vegetables, legumes, fruit, grains, nuts, and seeds, but no food from animal sources. Fruitarianism: vegan diet consisting primarily of fruit. Raw veganism: vegan diet in which food is uncooked and sometimes dehydrated. Vegetarianism: diet of vegetables, legumes, fruit, nuts, and grains, that may include eggs and dairy, but no meat. Semi-vegetarianism: mostly vegetarian diet with occasional inclusion of meat and/or poultry. Macrobiotic diet: semi-vegetarian diet that highlights whole grains, vegetables, beans, miso soup, sea vegetables, and traditionally or naturally processed foods, with or without seafood and other animal products. Pescatarian: semi-vegetarian diet with eggs, dairy and seafood. A 2017 review found that a plant-based diet could reduce the risk of diabetes, cardiovascular diseases, and cancer, and associated morbitities of obesity, hypertension, hyperlipidemia, and inflammation. From other reviews, a plant-based diet reduced total and LDL cholesterol, with further evidence that shifting plant protein consumption to more than 50% of total protein intake may lower the risk of cardiovascular diseases, although further clinical research was recommended. A diet high in fruits and vegetables may decrease the risk of type 2 diabetes, high blood pressure, stroke, and colorectal cancer. A vegetarian diet may also help with weight loss. Although herbivory (reliance on diet entirely of plants) was long thought to be a Mesozoic phenomenon, evidence of it is found as soon as the fossils which could show it. Within less than 20 million years after the first land plants evolved, plants were being consumed by arthropods. Herbivory among four-limbed terrestrial vertebrates, the tetrapods developed in the Late Carboniferous (307 - 299 million years ago). Early tetrapods were large amphibious piscivores. While amphibians continued to feed on fish and insects, some reptiles began exploring two new food types: the tetrapods (carnivory) and plants (herbivory). Carnivory was a natural transition from insectivory for medium and large tetrapods, requiring minimal adaptation. In contrast, a complex set of adaptations was necessary for feeding on highly fibrous plant materials. Quite often, mainly herbivorous creatures will eat small quantities of animal-based food when it becomes available. Although this is trivial most of the time, omnivorous or herbivorous birds, such as sparrows, often will feed their chicks insects while food is most needed for growth. On close inspection it appears that nectar-feeding birds such as sunbirds rely on the ants and other insects that they find in flowers, not for a richer supply of protein, but for essential nutrients such as Vitamin B12 that are absent from nectar. Similarly, monkeys of many species eat maggoty fruit, sometimes in clear preference to sound fruit. When to refer to such animals as omnivorous or otherwise, is a question of context and emphasis, rather than of definition. Humans are omnivorous, capable of consuming diverse plant and animal foods. Fossil evidence from wear patterns on teeth indicates the possibility that early hominids like robust australopithecines and Homo habilis were opportunistic omnivores, generally subsisting on a plant-based diet, but supplementing with meat when possible. ^ a b Taylor Wolfram (1 October 2018). "Vegetarianism: The basic facts". Academy of Nutrition and Dietetics. Retrieved 21 April 2019. ^ a b c d e f Summerfield, Liane M. (2012-08-08). Nutrition, Exercise, and Behavior: An Integrated Approach to Weight Management (2nd ed.). Cengage Learning. pp. 181–182. ISBN 9780840069245. A plant-based diet is not necessarily a vegetarian diet. Many people on plant-based diets continue to use meat products and/or fish but in smaller quantities. ^ Tuso, Philip J.; Ismail, Mohamed H.; Ha, Benjamin P.; Bartolotto, Carole (Spring 2013). "Nutritional Update for Physicians: Plant-Based Diets". The Permanente Journal. Kaiser Permanente. 17 (2): 61–66. doi:10.7812/TPP/12-085. PMC 3662288. PMID 23704846. ... a plant-based diet, which we define as a regimen that encourages whole, plant-based foods and discourages meats, dairy products, and eggs as well as all refined and processed foods. ^ McManus, Katherine D. (September 26, 2018). "What is a plant-based diet and why should you try it?". Harvard Medical School. It doesn't mean that you are vegetarian or vegan and never eat meat or dairy. Rather, you are proportionately choosing more of your foods from plant sources. ^ "Position of the Academy of Nutrition and Dietetics: Vegetarian Diets". Academy of Nutrition and Dietetics. 2016. Retrieved 21 April 2019. ^ a b c d McMacken, M; Shah, S (2017). "A plant-based diet for the prevention and treatment of type 2 diabetes". Journal of Geriatric Cardiology. 14 (5): 342–354. doi:10.11909/j.issn.1671-5411.2017.05.009. PMC 5466941. PMID 28630614. ^ Gorissen, Stefan H. M.; Witard, Oliver C. (29 August 2017). "Characterising the muscle anabolic potential of dairy, meat and plant-based protein sources in older adults". Proceedings of the Nutrition Society. 77 (1): 20–31. doi:10.1017/S002966511700194X. PMID 28847314. Retrieved 6 August 2018. ^ T. Colin Campbell and Thomas M. Campbell II, The China Study (2005). ^ The China Study (2005), p. 139. "foods that were mostly low-fat, whole-food and plant-based"; "a mostly plant-based diet"; "a low-fat, whole foods, mostly plant-based diet"
^ a b Ellen Jaffe Jones, in Michelle Stark, "Wellness experts weigh in on the vegan diet", Tampa Bay Times (May 25, 2015). ^ See American Dietetic Association and Dietitians of Canada, "Position of the American Dietetic Association and Dietitians of Canada: Vegetarian diets" (February 16, 2014): " ... plant-based diets, defined as diets that include generous amounts of plant foods and limited amounts of animal foods", and listing the views of other groups. ^ a b c Dwyer, J (2003). "Vegetarian Diets". In Caballero, Benjamin; Trugo, Luiz C.; Finglas., Paul M. (eds.). Encyclopedia of Food Sciences and Nutrition (Second Edition). Academic Press/Elsevier. pp. 5974–5979. ISBN 978-0-12-227055-0. ^ Wanjek, Christopher (January 15, 2013). "Reality Check: 5 Risks of Raw Vegan Diet". Live Science. Retrieved September 23, 2017. ^ Rogers, Monica Kass. "Macrobiotic Diet". WebMD. WebMD, LLC. Retrieved 5 February 2017. ^ Li, S. S; Blanco Mejia, S; Lytvyn, L; Stewart, S. E; Viguiliouk, E; Ha, V; De Souza, R. J; Leiter, L. A; Kendall, C. W; Jenkins, D. J; Sievenpiper, J. L (2017). "Effect of Plant Protein on Blood Lipids: A Systematic Review and Meta‐Analysis of Randomized Controlled Trials". Journal of the American Heart Association. 6 (12): e006659. doi:10.1161/JAHA.117.006659. PMC 5779002. PMID 29263032. ^ Yokoyama, Yoko; Levin, Susan M; Barnard, Neal D (2017). "Association between plant-based diets and plasma lipids: A systematic review and meta-analysis". Nutrition Reviews. 75 (9): 683–698. doi:10.1093/nutrit/nux030. PMC 5914369. PMID 28938794. ^ Boeing, H; Bechthold, A; Bub, A; Ellinger, S; Haller, D; Kroke, A; Leschik-Bonnet, E; Müller, MJ; Oberritter, H; Schulze, M; Stehle, P; Watzl, B (September 2012). "Critical review: vegetables and fruit in the prevention of chronic diseases". European Journal of Nutrition. 51 (6): 637–63. doi:10.1007/s00394-012-0380-y. PMC 3419346. PMID 22684631. ^ Steck, S. E.; Guinter, M; Zheng, J; Thomson, C. A. (2015). "Index-based dietary patterns and colorectal cancer risk: A systematic review". Advances in Nutrition. 6 (6): 763–73. doi:10.3945/an.115.009746. PMC 4642428. PMID 26567200. ^ Barnard, ND; Levin, SM; Yokoyama, Y (June 2015). "A systematic review and meta-analysis of changes in body weight in clinical trials of vegetarian diets". Journal of the Academy of Nutrition and Dietetics. 115 (6): 954–69. doi:10.1016/j.jand.2014.11.016. PMID 25620754. ^ Labandeira, C. (2007). "The origin of herbivory on land: Initial patterns of plant tissue consumption by arthropods". Insect Science. 14 (4): 259–275. doi:10.1111/j.1744-7917.2007.00152.x. ^ a b c Sahney S, Benton MJ, Falcon-Lang HJ (2010). "Rainforest collapse triggered Pennsylvanian tetrapod diversification in Euramerica" (PDF). Geology. 38 (12): 1079–1082. doi:10.1130/G31182.1. ^ Ungar, P. S; Sponheimer, M (2011). "The diets of early hominins". Science. 334 (6053): 190–3. doi:10.1126/science.1207701. PMID 21998380. ^ Timothy Clack, Ancestral Roots: Modern Living and Human Evolution (2008), p. 324. ^ Robert Foley, "The Evolutionary Consequences of Increased Carnivory in Hominids", in Meat-Eating and Human Evolution (2001), p. 321.